One of the most favorable traits of a Bichon Frise dog is the fact they are hypoallergenic, also known as non-allergenic. People who suffer from pet dander allergies often think that they will never get the chance to own a dog. 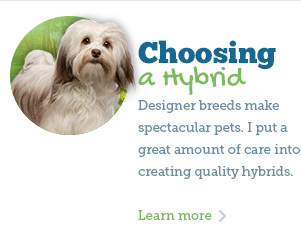 At Toy Puppies by Myra, I limit the breeds that I raise to non-shedding and mostly hypoallergenic dogs. Bichon Frise puppies are unique in not only their good temper and physical appearance but also in that they allow people allergic to dogs and other animals the opportunity to own a loving pet. Bichon Frise are considered non-allergenic because of their non-shedding coat and the fact their curly hair will help retain dander. Hypoallergenic breeds such as the Bichon Frise greatly reduce the risk of allergic individuals having a reaction to the dog's coat. Bichon Frise coats are textured and silky and do not shed like normal dogs. The no-shed coat will save you from having to constantly clean your furniture and from having your allergies aggravated by the constant shedding and dander associated with other breeds. 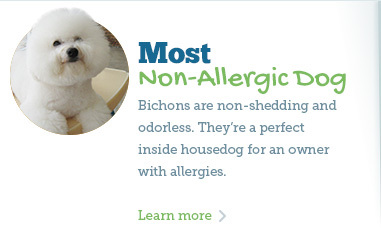 These traits also make the Bichon Frise almost odorless. There will be no "dog smell" in your home if you choose to own a Bichon Frise. Allergy sufferers can still own dogs and have the pleasure of a friendly and fluffy companion in their lives. 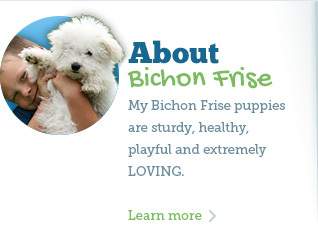 Bichon Frise are fantastic hypoallergenic dogs that also make great housedogs. With coats that do not shed and no odor to deal with, these loving and playful puppies can stay in your home and even sit on your furniture without you having to worry about the smell or the hair. There are many other great qualities of these breeds, including their cheerful attitude and calm demeanor. If you are interested in owning a Bichon Frise, work with a reputable Fort Lauderdale breeder such as Toy Puppies by Myra. If you have questions about your allergies or about the Bichon breed, do not hesitate to contact me and inquire about my litters.